Learn how Financial Services partners like IHS Markit are using AWS to address financial regulatory requirements for financial risk management. New Basel financial risk regulations released in 2016 are transforming global bank risk systems. In January 2016, the Basel Committee on Banking Supervision published the Fundamental Review of the Trading Book (FRTB) standards, which introduced a new approach to evaluating risk across asset holdings, and will be mandated by 2020. The FRTB regulation establishes a new expected shortfall (ES) measurement of risk under stress, which replaces previous value-at-risk (VaR) based models for internally modeled assets. This ES measurement is expected to require a tenfold increase in calculations, in part due to the requirement that risk factor shifts be assessed over multiple time horizons based on their liquidity. Furthermore, FRTB mandates daily risk attribution and back-testing requirements as well as intra-day monitoring of risk exposures that may put pressure on existing platforms as computational needs increase. Meanwhile, capital restrictions are driving banks to seek increasingly cost-effective solutions that provide the agility to keep pace with regulatory changes while keeping costs under control. In this post, we will explore some of the ways that the scalability and elasticity of the AWS Cloud are being used to support the need for large-scale financial calculations that may be required by many banks as they prepare to support FRTB and other financial risk requirements. A fundamental change from existing Basel 2.5/3 calculations is the use of more granular liquidity time horizons when determining risk via the Internal Models Approach (IMA). An asset held on a trading desk requiring IMA will now need profit and loss vectors at the risk factor level, with additional calculations aggregating time horizon permutations. Furthermore, the Standardized Approach (SA) to risk calculation is required even for desks using IMA. Another challenge comes with the required validation of IMA calculations against real-world economic impact. Banks will need to prove that internal models are within a strict tolerance, or risk being held to the more conservative SA capital requirement. These changes are estimated to require 10 times as many calculations for the average portfolio, which means that a significant increase in server capacity will be required to produce results in the expected timeframe. One solution provider is taking a cloud-first approach to meet this challenge. IHS Markit, an Advanced Technology Partner and an APN Partner with AWS Financial Services Competency, launched its FRTB Solution Suite to address the significant expansion of risk measures and more stringent modeling methodologies required by this regulation. The FRTB Solution Suite is a next-generation risk management platform that uses the scalable computational power provided by AWS. 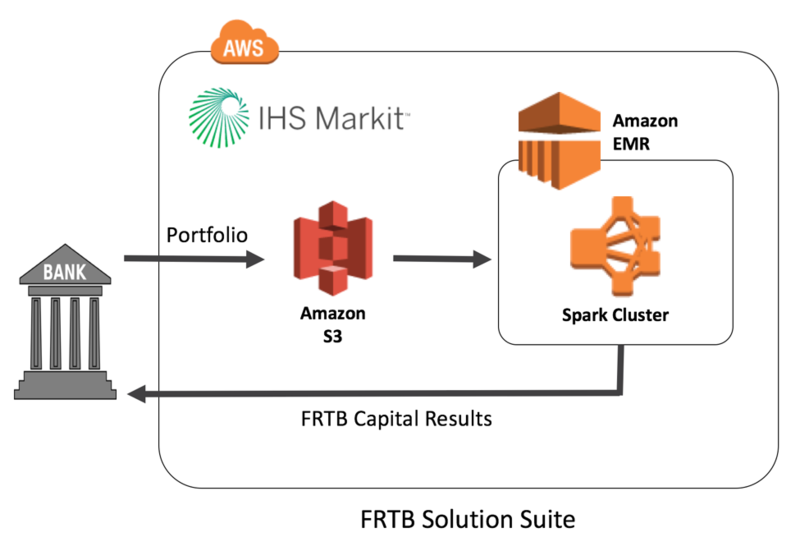 When developing the FRTB Solution Suite, IHS Markit evaluated AWS and other prominent cloud providers. “AWS meets our needs in terms of scalability, affordability, security, and its track record of successful implementations,” says Andrew Eisen, managing director, global head of cloud strategy and hosting services, at IHS Markit. “Using AWS, we can instantly deploy capacity for risk scenarios and dynamically scale the system to account for the complexity and data volumes those scenarios demand, providing us with the flexibility we need. Furthermore, being able to leverage a combination of reserved instances and spot pricing allows us to do so at a reasonable cost.” The FRTB Solution Suite uses AWS services such as Amazon Elastic Compute Cloud (Amazon EC2), Auto Scaling, Amazon EMR, and Amazon Simple Storage Service (Amazon S3) to optimize its platform. Although banks require more compute capacity to meet regulations like FRTB, capacity demand is not static. Risk calculations may spike overnight and in highly volatile markets, and may be moderate otherwise. 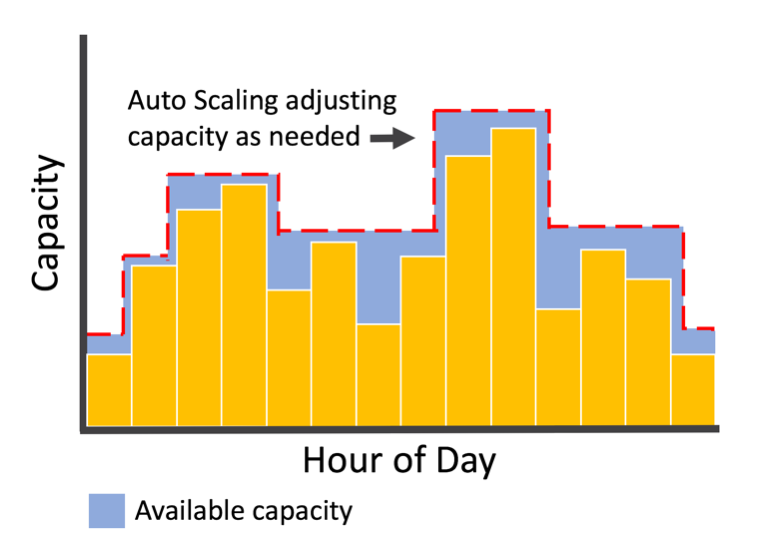 Auto Scaling enables dynamic resource use by monitoring CPU and memory utilization to detect times when additional horsepower is needed, and turn it off when it isn’t. And because you only pay for what you use, costs are kept under control. Assessing liquidity for an asset at the risk factor level requires mining petabytes of historical transactions and prices. IHS Markit selected Apache Spark for its analytics engine because Spark is a distributed processing system that scales horizontally and is optimized for high-performance processing of large datasets. To ensure that computation costs are optimized and to free up developers to focus on developing the business rules specific to FRTB risk, Amazon EMR was chosen to run and manage the Spark cluster. Amazon EMR offers increased speed and agility by automatically scaling to meet demand, adding nodes when performance is constrained, and removing nodes that are underutilized. Amazon EMR is also integrated with the Amazon EC2 Spot Instance market, which keeps costs to a minimum by accessing unused Amazon EC2 capacity at steep discounts relative to On-Demand Instance prices. IHS Markit wanted to ensure that their risk results were durable and available across Availability Zones, so the company chose Amazon S3 to store their risk data. They were able to take advantage of Amazon EMRs decoupling of storage and compute, by using Spark to query data directly in Amazon S3 without the need to load data into on-cluster HDFS. By operating Spark as a cluster using Amazon EMR, IHS Markit avoids the administrative complexity of capacity management, data security management, and software deployment. These capabilities enable IHS Markit to focus time and energy on delivering business value to its customers rather than the undifferentiated heavy lifting of operating foundational components at scale. As Financial Services organizations are using AWS to simplify access to technologies such as big data analytics, high performance computing and deep learning, a qualitative change to addressing business needs has become possible. Capitalizing on this newfound elasticity and velocity, firms are able to respond to regulatory and customer needs at an unprecedented pace. IHS Markit’s FRTB Solution Suite demonstrates how organizations are taking advantage of these capabilities to solve key financial market drivers. If you have any questions or comments about cloud solutions for financial services, please contact us at apn-blog@amazon.com.